How to Bike to Work-A Great Guide and Great Blog from Paul Dorn! So, you want to bike to work. But you aren’t sure how safe it is, or what to wear or how to safely lock your bike. Have I got a book for you! And a great blog. 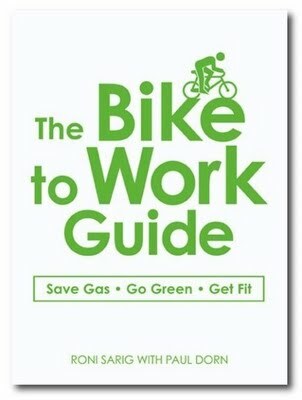 The book, How to Bike to Work Guide, is pretty self explanatory and it’s available for just a few dollars from Amazon here. The blog, Bike Commute Tips Blog is here and it’s free. The author, Paul Dorn lives in Sacramento, California. Paul is a writer, activist, and co-author (with Roni Sarig) of The Bike to Work Guide: What You Need to Know to Save Gas, Go Green, Get Fit (Adams Media, 2009). He is the former editor of the Tube Times, newsletter of the San Francisco Bicycle Coalition (SFBC), and served on the SFBC board of directors. He is the former executive director of the California Bicycle Coalition. Dorn is certified by the League of American Bicyclists as a League Cycling Instructor (#1237).